In 1938, the United States Navy placed an order for 54 Brewster F2A-1 Buffalo single-seat carrier-born fighters. A mid-wing design of all-metal construction with fabric control surfaces, the Buffalo entered USN service in 1939. A batch of 44 was supplied to Finland and some 170 were ordered by the RAF and flown also by the RAAF and the RNZAF in defense of Malaya and Singapore faring badly against the hands of the superior Japanese fighters. Transfers for both a USN and an RAF aircraft were included. powered by 1,200 h.p. Wright R-1820-40 engine, the F2A-3 Buffalo had a maximum speed of 321 m.p.h. at 16,000 ft. and an armament of four.5 machine guns. Span was 35 ft., length was 26 ft. 4 in., height was 12 ft. 1 in. 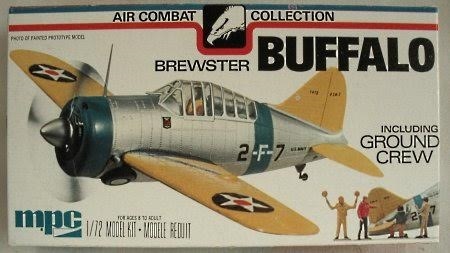 MPC was a distributor of Airfix kit and was under Fundimentions of the General Mills Company at Mt. Clemens, MI. It has a copyright date of 1975 and was re-released up until 2008. I bought my kit back in the 70's for a whopping $1.09. The box art shows a Buffalo posed against an all-white background. It has a bare metal fuselage with yellow wings, rudder and elevators. It has a navy blue cowling, a bare metal prop spinner and a navy blue fuselage band. Over the fuselage band is the code of a black 2 white -F- black 7 followed by a small black U.S. NAVY. The rudder has a small serial no. 1412 followed by F2A-2. It carries blue circles with white stars on them that have red circles in the middle. 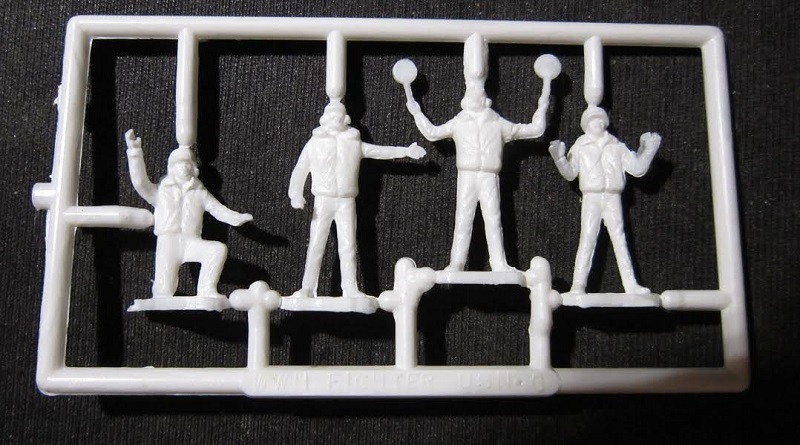 A corner of the box art shows 4 ground crewmen. The kit is said to be part of MPC's Air Combat Collection. On one side panel there is an offer to get famous combat patches with details inside the kit. I find no details inside for this and maybe I threw them away years ago?? Next to this is 4 color walk around type photos of the kit made up. The other side panel repeats these walk around photos and gives a one paragraph history of the Buffalo. This kit contains 2 chalk white trees of parts and loose chalk white fuselage and wing halves in a sealed cello bag. The clear tree, decal sheet and instructions complete the kits contents. 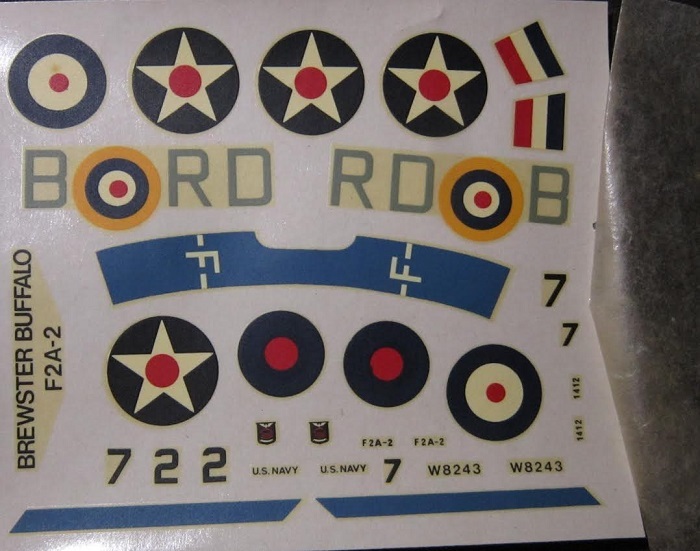 Although MPC provided a frosted sheet to protect the decal from scratching, it was floating around loose in the kit and not protecting a darn thing. So I stapled it onto the decal sheet. A chalk white tree of the four ground-crewmen is loose in the box and not in the cello bag with the other white parts. The instructions in the kit are not the ones that were originally in it. Instead they are off a Airfix bagged kit of the Buffalo. They are a single sheet folded in the center to create 4 pages in 7" x 6 1/4" format. Page one has a color box art of the scheme that is included in this kit. (to be described below later). The history of the Buffalo is given in English, French and German. Spread across pages 2 and 3 is 5 assembly steps with general instructions in the 3 languages. Page 4 has two 3-views of schemes and markings. The first one is the scheme on the instructions. It is a Buffalo in a wave pattern of olive green and light brown over duck egg blue under-carriage. It carries the fuselage code of RD (roundel)B in sky color and has a black spinner with a bare metal tip. It carries the small black serial no.WB243 on the rear of the fuselage sides. The second scheme is for the box art subject, already described above. However, this 3-view shows further that there is a black slanted stripe above each upper wing and black walkways at the wing roots. We are not told what units these two aircraft were assigned to. 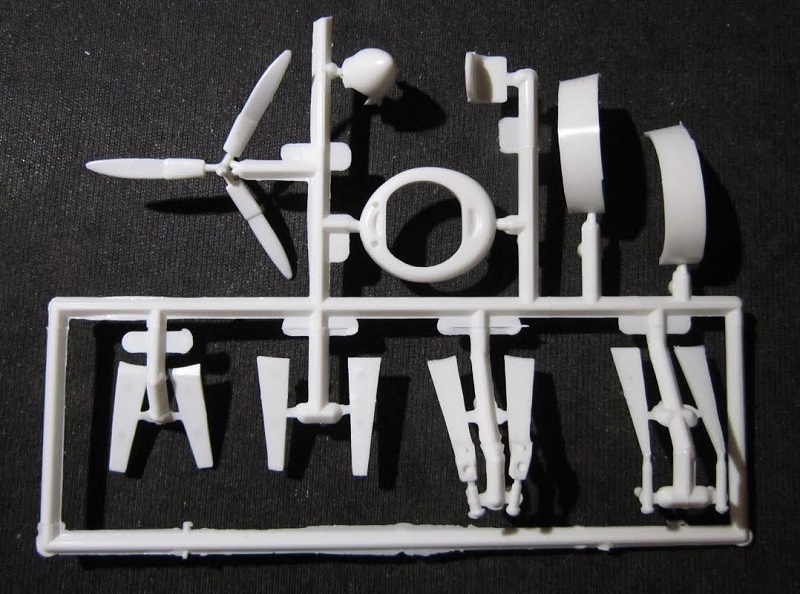 Control surfaces are all molded solid and the panel lines are of the raised variety. However, this kit can be made quite presentable in the right hands. ​The third chalk white tree holds the 4 ground-crewmen. They are in pretty nice action poses and full bodied. 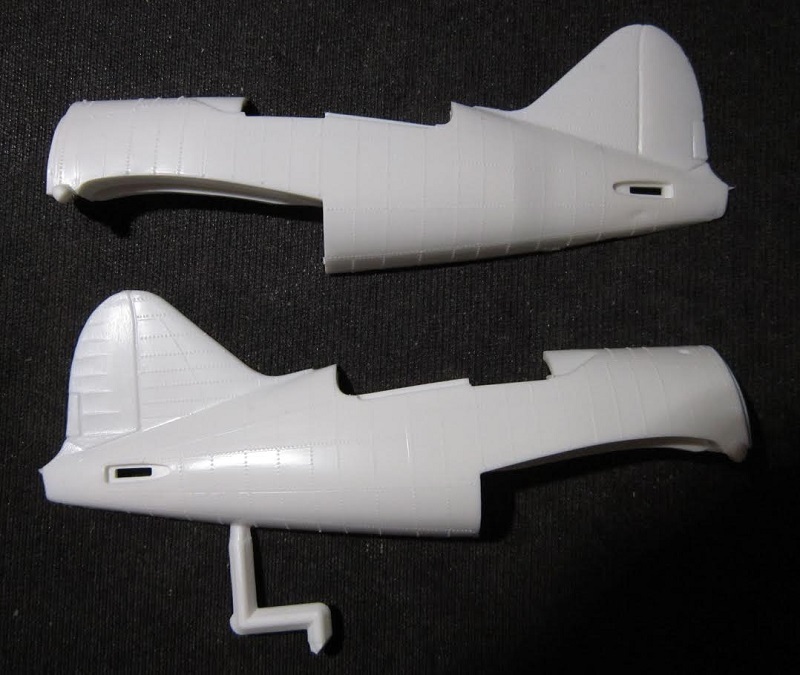 ​Loose chalk white parts are the wing halves (3 parts) and the 2 fuselage halves. 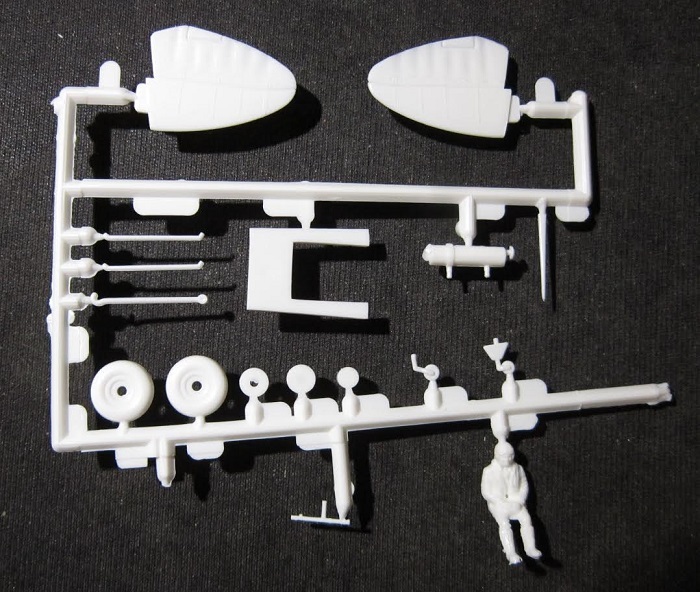 ​Next is the clear parts tree. It holds 5 cockpit transparencies and can be built open or closed. ​Panel lines are of the raised variety. Nice to have separate wing flaps, but the rudder is molded solid. This kit looks like it will make up into a fairly decent display. Recommended. The price tag still in the box says that I bought this kit in the 70's at a Target store for a song. ​This kit is for sale for a decent offer.